Women's Chunky Silver Chain Bracelet : LOVE2HAVE in the UK! 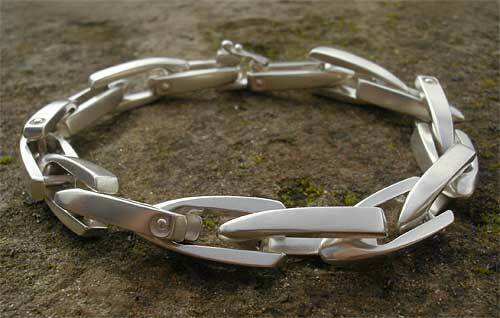 A women's chunky silver chain bracelet. Women like their chunky jewellery too and with Love2Have being the best place on the web to find women's unique jewellery then look no further than this piece. This solid sterling silver bracelet both epitomises chunkiness and designer styling in a single package. 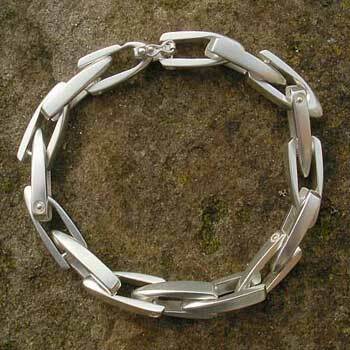 The links are like no other and have a stirrup type shape to them, each individually smoothed and tapered into a streamlined design and conjoined together by a secure pillar type arrangement which allows them to move freely with one another to wrap around the wrist in a very slick manner. Each link measures 22mm in length and 4mm x 8mm in thickness and width. The silver finish is a luscious, silky matt that subtly reflects the light and therefore avoiding a tacky feel of cheap over polished silver. The standard size is 8 inches, but we can accommodate other measurements if you so wish.